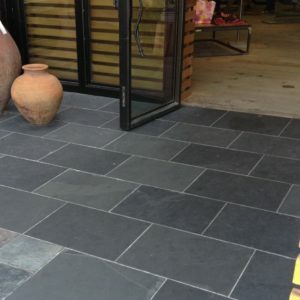 Nothing beats the character natural slate flooring can bring to your home or business. There’s no duplicating the warmth, durability, and unique attributes of this extraordinary stone with any man-made alternatives. The split stone surface of slate is unique in texture, pattern, and coloring, delivering a look that’s completely one-of-a-kind. Naturally waterproof, slate flooring won’t become damaged by water over time, making it compatible with indoor and outdoor use. One of very few types of flooring that is slip-resistant, it is ideal for water-prone locations such as entryways, kitchens, bathrooms, pool areas, patios, and walkways. Slate’s waterproof nature also makes it naturally stain resistant, and an ideal solution for areas where spills and stains are common, such as kitchen and dining areas. Its easy-to-clean surface is naturally bacteria resistant, making it a superior flooring solution to keep clean. 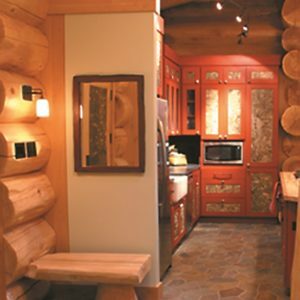 With a reputation for longevity, slate flooring in Denver holds up well to wear-and-tear, even withstanding fire. For those weary of constantly cleaning and polishing high-traffic areas, slate offers a simple solution. Simply sweep, mop with water and a few drops of dish detergent, and air-dry this kid-friendly, naturally footprint-free flooring. 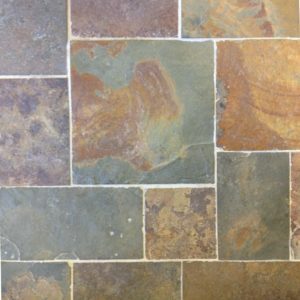 Slate for flooring is one of the most versatile types of flooring on the market today. 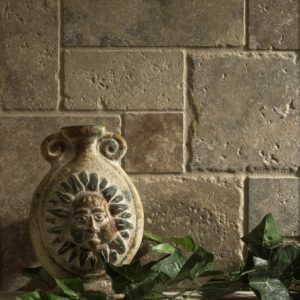 Because it can be used in interior and exterior applications, it comes in a variety of styles, from stone-split tiles to thicker, cleft-face stone for veneer. Available in colors ranging from black and gray, to those with facets of dark green, red, blue, purple, and gold, finding a style to match your décor has never been so easy. At PetraSlate, we stake our reputation on our ability to source only quality slate flooring, wall, and roofing tile that will deliver optimum performance for residential as well as commercial applications, providing only the best quality slate materials available anywhere through our network of high-end flooring stores, tile contractors, and other craftsmen. Every quarry from which our slate products are sourced have a reputation in the industry for superior coloring and hardness, and being uniformly gauged in manufacturing, to ensure a smooth, even surface for fast and accurate installation that will need very few call backs. Looking for a surface that outperforms and perseveres? Unearth the beauty of natural slate flooring in our Denver showroom. Contact PetraSlate today.